5. College of Biology, Hunan University, Changsha, Hunan 410082, China. Nasopharyngeal carcinoma (NPC) is an Epstein-Barr virus-associated malignancy occurring at high incidence in Southeast Asia and southern China. In spite of the good response to radio- and chemo-therapy at the early stage, resistance and recurrence develop in NPC patients in the advanced setting. Cancer stem cells (CSCs) play an important role in drug resistance and cancer recurrence. Here we report that lovastatin, a natural compound and a lipophilic statin that has already been used in the clinic to treat hypercholesterolemia, inhibited the CSC properties and induced apoptosis and cell cycle arrest in sphere-forming cells derived from the 5-8F and 6-10B NPC cell lines. Furthermore, lovastatin conferred enhanced sensitivity to the chemotherapeutic and photodynamic agents in NPC CSCs. Together our findings suggest that targeting CSCs by lovastatin in combination with routine chemotherapeutic drugs or photodynamic therapy might be a promising approach to the treatment of NPC. Keywords: Lovastatin, Cancer stem cells, Nasopharyngeal carcinoma, Chemotherapy, Photodynamic therapy. Nasopharyngeal carcinoma (NPC) is the most common head and neck cancer in Southeast Asia and southern China [1, 2]. NPC is distinct from other head and neck malignancies in that NPC displays the characteristics of poor differentiation and strong propensity to metastasize to the regional lymph node and/or distant organs [3, 4]. Synergetic actions of genetic alterations, Epstein-Barr virus (EBV) infection, and environmental factors contribute to the initiation and progression of NPC [2, 5]. While high-dose radiation remains the primary treatment for most NPC patients, the addition of chemotherapy results in increased overall and disease-free survival especially for the advanced-stage patients . Limitations in these therapeutic applications, however, exist due to undesirable side effects, local recurrence, and metastasis . These limitations call for novel targets and optional approaches for the treatment of NPC. Cancer stem cells (CSCs) are a small subset of cancer cells which share several common features such as self-renewal, multi-lineage differentiation, sphere formation, and tumorigenicity . While conventional therapies are able to target the bulk tumor cells, CSCs are resistant to many current radio- and/or chemo-therapeutic modalities, which might be the major reason of tumor recurrence and relapse [9, 10]. Therefore, development of therapeutic strategies that preferentially target CSCs is of great importance in reducing the risk of relapse and improving the outcome of malignancies. Novel therapeutic agents that selectively target CSCs are being explored and some of them have shown promising results in preclinical and clinical studies [9, 11]. Recently, natural compounds have gained special attention in cancer therapeutics because of their ability to eliminate CSCs. Plant-derived compounds that are known to target CSCs include curcumin, sulforaphane, resveratrol, genistein, and polyphenols [12, 13]. Lovastatin (LV), also known as Monacolin K or mevinolin, is a natural compound derived from Monascus or Aspergillus-fermented rice and Dioscorea . The content of LV is also high in the fungus Pleurotus ostreatus, Oyster mushroom . LV is the first statin to be approved by the US FDA in 1987 as a cholesterol-lowering drug. Statins are 3-hydroxy-3-methylglutaryl coenzyme A (HMG-CoA) reductase inhibitors that are widely used in the clinic for the treatment of hypercholesterolemia, thus reducing the incidence of cardiovascular and cerebrovascular events . Anti-cancer effects of stains have been reported in a variety of cancer types including breast cancer [17, 18], prostate cancer , esophageal carcinoma , and ovarian cancer . Recently, it has been shown that statins such as simvastatin target CSCs derived from breast cancer . However, it is not known whether statins have similar effects on NPC CSCs. In the present study, we have provided evidence to demonstrate that LV, one of the naturally occurring lipophilic statins, has the ability to inhibit proliferation and self-renewal and induce apoptosis and cell cycle arrest of NPC CSCs. We also showed that LV could synergistically enhance the sensitivity of NPC CSCs to chemotherapy and photodynamic therapy. These observations will open the window to repurpose the lipid-lowering drugs as anti-cancer therapeutics for the treatment of NPC. Antibodies against CD44 (Abcam, Cat #ab51037), c-Myc (Abcam, Cat #ab32072), CBFb (Abcam, Cat #ab133600), and GAPDH (ZSGB-BIO, Cat #TA-08) were obtained commercially. FITC-conjugated CD44 antibody (BD, Cat #560977) was purchased from BD Biosciences (Franklin Lakes, NJ, USA). Statins were purchased from Abcam (atorvastatin [ab145604], lovastatin [ab120614], and simvastatin [ab120505]) or Sigma-Aldrich (St Louis, MO, USA) and dissolved in DMSO as a 20 ~ 30 mM stock solution and stored at -20°C before use. Chemotherapeutic drugs (cyclophosphamide [CPA], cisplatin [DDP], doxorubicin [DOX], and paclitaxel [TXL] were obtained from the in-hospital pharmacy or Selleck (Shanghai, China). The photosensitizer polyhematoporphyrin (C34H38N4NaO5, Photosan-II [PS-II]) was purchased from Seehof Laboratorium F&E GmbH (Wesselburenerkoog, Germany). NPC cell lines 5-8F and 6-10B were obtained from Cancer Research Institute of Central South University. Both cell lines were maintained in RPMI 1640 medium supplemented with 10% fetal bovine serum (FBS) at 37°C in a humidified atmosphere of 5% CO2 as described . The cells were tested for mycoplasma contamination and rendered mycoplasma-negative before the experiments. For treatment, the cells were seeded in culture dishes or plates (1 × 105 cells/ml) and allowed to grow overnight under normoxia (21% O2) before treatment. The next day, the respective statin with or without the chemotherapeutic or photodynamic drug was added to the cells at various concentrations and the culture was continued for the desired period of time under hypoxia (1% O2). Hypoxic culture condition was achieved in a hypoxic chamber (Thermo Fisher Scientific, Waltham, MA, USA) by inflation of N2 into the air-filled chamber as described . The CSCs were enriched in 6-well ultra-low attachment plates (2,500 cells/well) in serum-free medium according to the published tumorsphere culture technique . The culture medium consisted of DMEM/F-12 (Life Technologies, Carlsbad, CA, USA) supplemented with 1× B27 (without vitamin A) (Life Technologies 12587-010), 20 ng/ml EGF (Prospec, East Brunswick, NJ, USA, Cyt-217-b), 20 ng/ml bFGF (Prospec Cyt-218-b), 0.4% BSA (Sigma, St. Louis, MO, USA), 4 µg/ml Insulin (Genview, Beijing, China, FI174). The tumorspheres were passaged every 6 days, with the sphere-forming capacity retained for at least six generations. The CSC phenotype was characterized according to the expression of NPC CSC surface marker CD44 and the self-renewal capacity. Self-renewal assay was performed according to the published procedure  with some modifications. Briefly, single cell suspension of sphere-forming cells (SFCs) at a density of 100 cells/ml (100 µl/well) was plated in 96-well ultra-low attachment plates in sphere culture medium. The next day, different concentrations of LV and/or drugs were added to the medium and the culture was continued for 72 h under hypoxia followed by image capture (one image per well taken in the center of each well). The surface areas of tumorspheres were measured using the Adobe Photoshop CS3 software (San Jose, CA, USA). The sphere formation unit was obtained by multiplying the number of tumorspheres and the surface areas of the tumorspheres in each well. 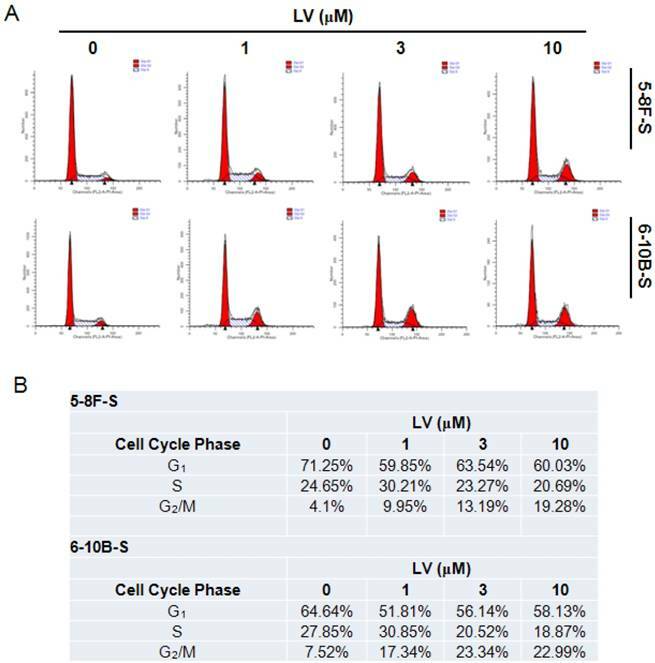 To assess the effects of LV on cell proliferation, NPC parental cells and CSCs were seeded in 96-well plates at a density of 1 × 105 cells/ml (for parental cells) or 4 × 104 cells/ml (for CSCs) in a volume of 100 µl/well. The next day, the cells were treated with LV or a combination of LV and chemotherapeutic drugs and cultured under hypoxia (1% O2) for 72 h. Cell proliferation/viability was measured using an Alamar Blue cell viability assay kit (Promega, Madison, WI, USA) as described by our group . The values of half maximal inhibitory concentration (IC50) were calculated using the GraphPad Prism software (La Jolla, CA, USA). The cells seeded into 35-mm dishes at a density of 4 × 104 cells/ml were treated with different concentrations of LV for 72 h under hypoxia. Cell death was determined using the Annexin V-FITC/propidium iodide (PI) apoptosis detection kit (Seven Sea Biotech, Shanghai, China) with a BD FACS Canto II flow cytometer (Franklin Lakes, NJ, USA) according to the previously published method . The cells (1 × 105 cells/ml) grown in 35-mm dishes were treated with different concentrations of LV for 72 h under hypoxia. The cells were fixed in 70% ethanol followed by PI staining of DNA and analyzed by flow cytometry as described . Whole cell lysates were prepared from cultured cells using 1X cell lysis buffer (Cell Signaling Technology, Danvers, MA, USA) with 1X protease inhibitor cocktail (Complete Mini, Roche, Mannheim, Germany) and 1 mM phenylmethanesulfonyl fluoride (Sigma-Aldrich) added. The supernatants (whole cell lysates) were collected and quantified by the BCA protein quantification method. The lysates were mixed with the LDS sample buffer and reducing agent and denatured by boiling. The same quantity of protein from each sample was then separated on 10% denaturing PAGE gels followed by incubation with the respective primary antibody and the HRP-conjugated secondary antibody and subsequent ECL development according to our standard procedure . Drug interaction was analyzed according to the Chou-Talalay method . Briefly, the cells were treated with serial dilutions of therapeutic drugs and LV, either individually or in combination, under hypoxia for the desired period of time. Cell viability and self-renewal assays were performed as described above. Combination index (CI) was calculated using the CompuSyn software (New York, NY, USA). Synergistic, additive, or antagonistic combination was determined according to the calculated CI values (< 1.0, = 1.0, or > 1.0, respectively). The subconfluent cells were pretreated with LV or vehicle under hypoxia for 24 h followed by treatment with different concentrations of PS-II in culture medium for 4 h. After that, the cells were exposed to a 630 nm laser with a light intensity of 10J/cm2 for 60 s. The laser was emitted from a semiconductor laser device manufactured and provided by the Laser Medical Tech Co., Ltd (Shenzhen, China). The irradiated cells were further incubated for different time durations depending on the experimental purposes. The quantitative data obtained from at least two independent experiments were presented as mean ± SEM and analyzed by one-way ANOVA followed by Holm Sidak post hoc test. P < 0.05 was considered statistically significant. In this study, we used two NPC subclones, 5-8F and 6-10B, that were derived from the same precursor cell line (SUNE-1) but with different metastatic potential  as our cell model. We enriched CSCs from both 5-8F and 6-10B cells using the tumorsphere culture technique as recently described . These cells formed tumorspheres approximately 2 to 3 days after initial culture, which showed obvious morphological difference compared with the parental cells. Prolonged culture maintained the ability of these cells to form tumorspheres (Fig. S1). Flow cytometric analysis revealed that these SFCs had increased level of CD44, the characteristic marker phenotype of NPC CSCs  (Fig. S2). We first examined the effect of LV on the proliferation of NPC CSCs and parental cells under a hypoxic culture condition. We found that LV inhibited the proliferation of both parental 5-8F and 6-10B cells and the SFCs derived from them, as evaluated by Alamar blue cell viability assay (Fig. 1A) and microscopic observation (Fig. 1B). However, LV had a greater inhibitory effect on NPC SFCs, as demonstrated by significantly lower IC50 values for SFCs than their respective parental counterpart (5-8F: 4.79±1.23 vs. 11.42±4.14 µM, P < 0.05; 6-10B: 3.01±0.42 vs. 9.30±3.67 µM, P < 0.05). These results suggest that the NPC CSCs might be a valid therapeutic target of LV. Lovastatin preferentially inhibits the proliferation of NPC sphere-forming cells as compared with the parental cells. 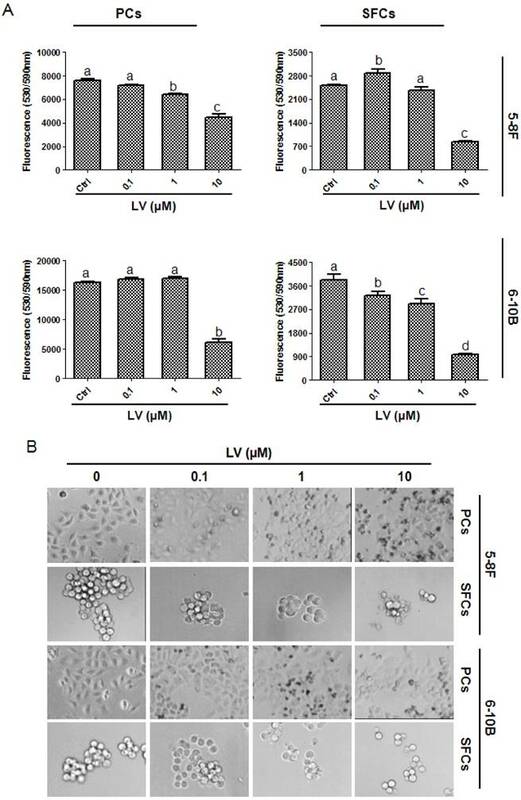 (A) 5-8F or 6-10B parental or sphere-forming cells were treated with different concentrations of LV under hypoxia for 72 h and subjected to Alamar Blue cell viability assay. (B) Photomicrographic images were taken after Alamar blue analysis. Original magnification: ×200. Different lower-case letters (a, b, c) denote statistically significant difference between the groups. PCs, parental cells; SFCs, sphere-forming cells. The effect of LV on the self-renewal capacity of NPC CSCs was analyzed by culturing SFCs in the presence or absence of LV. We found that LV, when used at 1 µM final concentration, could inhibit the self-renewal capacity of 5-8F SFCs by >70% compared with the vehicle control. We also compared the inhibitory effect of LV with the other two statins, atorvastatin and simvastatin. The three lipophilic statins performed similarly in inhibiting the self-renewal capacity of 5-8F SFCs (Fig. 2A, B). To determine whether LV inhibits the stemness marker proteins of NPC cells, we performed Western blot analysis on NPC SFCs treated with different concentrations of LV under hypoxia. Decreased protein levels of CD44 and SOX2 (NPC CSC marker proteins ), c-Myc (a master regulatory gene of CSCs ), core binding factor β (CBFb, a transcription factor required for the emergence of hematopoietic stem cells ), and Snail (a transcription factor involved in the induction of EMT and CSC renewal  were observed in 5-8F NPC SFCs treated with LV in a dose-dependent manner (Fig. 2C). These results suggest that LV and possibly other lipophilic statins could inhibit the stemness properties of NPC CSCs. The effect of LV on cell death in NPC CSCs was examined by staining with FITC-Annexin V and propidium iodide (PI) followed by flow cytometry. We found that LV dose-dependently induced apoptosis in 5-8F and 6-10B SFCs as shown by the increase in the fraction of cells in the early- and late-apoptosis stage. While low-dose (1 µM) of LV could induce a near 2-fold increase in the number of apoptotic cells compared with the vehicle control in either cell type, 10 µM of LV led to a 3.80-fold or 4.95-fold increase in the proportion of apoptotic cells in 5-8F or 6-10B SFCs, respectively (Fig. 3). Statins inhibit the stemness properties of NPC sphere-forming cells. (A, B) NPC sphere-forming cells were cultured in ultra-low attachment plates in the presence of different statins (1 µM) in stem cell culture medium. (A) Photomicrographic images were taken at the end of the 72-h culture period. Original magnification: ×200. (B) Sphere formation was quantified by multiplying the number of tumorspheres and the surface areas of the tumorspheres in each well. (C) The sphere-forming cells were treated with different concentrations of LV for 48 h and subjected to Western blot analysis. LV, lovastatin; AV, atorvastatin; SV, simvastatin. Induction of cell cycle entry is important in waking up the quiescent CSCs in the tumor mass . We tested whether LV could impact the cell cycle progression in NPC CSCs using the standard PI staining-flow cytometry technique. Exposure of 5-8F and 6-10B SFCs to LV resulted in cell cycle arrest at the G2/M phase, while decreasing the number of cells in the G1 and/or S phase (Fig. 4). These results indicate that LV may block the NPC CSCs at the G2/M checkpoint, preventing cells from entering mitosis and thus stopping proliferation. CSCs are the major reason of the failure of chemotherapy . Therefore, we tested whether LV could sensitize NPC CSCs to chemotherapeutic drugs routinely used in the clinic to treat NPC, including CPA, DDP, DOX, and TXL. As shown in Fig. 5A, in the absence of LV, these drugs had very little, if any, inhibitory effect on 5-8F or 6-10B SFCs in their respective clinically relevant dose range. 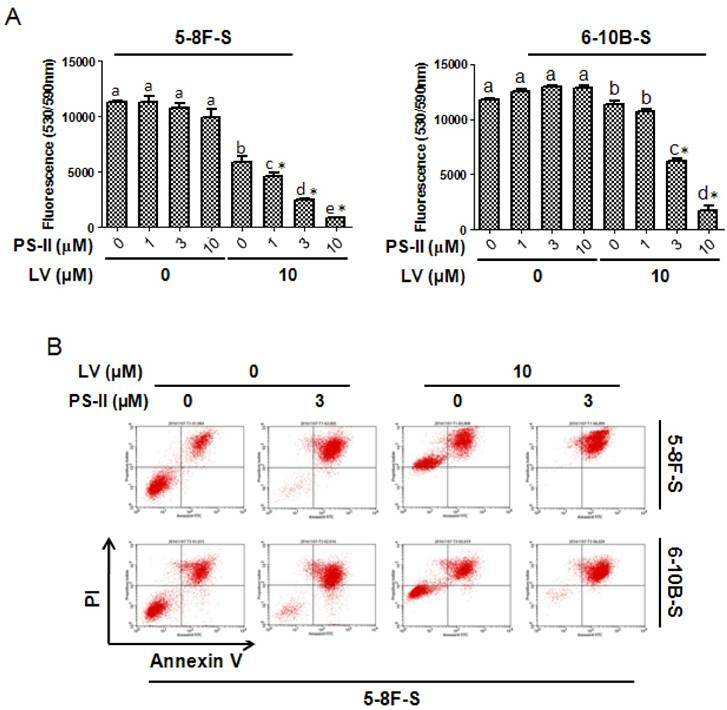 However, LV synergistically enhanced the sensitivity of 5-8F and 6-10B SFCs to CPA. LV did not show synergistic effect with the other three chemotherapeutic drugs, i.e., DDP, DOX, or TXL within the drug concentration range examined (data not shown). In addition, LV also synergistically enhanced the effect of CPA on inhibiting the self-renewal capacity of 5-8F SFCs (Fig. 5B, C). These results suggested that LV could sensitize the NPC CSCs to the chemotherapeutic drug CPA. Lovastatin promotes apoptosis in NPC sphere-forming cells. 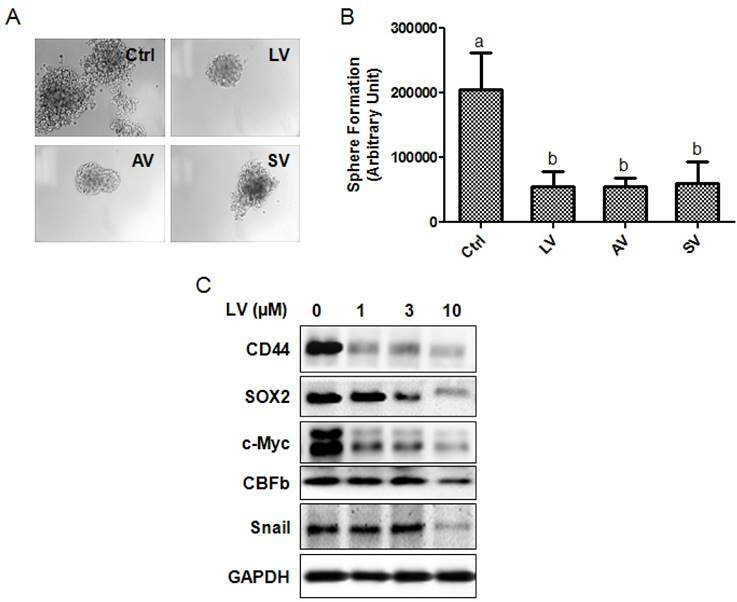 (A) NPC sphere-forming cells were treated with various concentrations of LV for 72 h under hypoxia and subjected to Annexin V/PI staining and flow cytometry. (B) Summary of the percentages of the number of cells in each fraction of cell death/survival. Lovastatin induces cell cycle arrest in NPC sphere-forming cells. (A) NPC sphere-forming cells were treated with various concentrations of LV for 72 h under hypoxia and subjected to PI staining and flow cytometry. (B) Summary of the percentages of the number of cells in each phase of the cell cycle. In a similar way, we investigated whether LV could enhance the sensitivity of NPC SFCs to PDT. As depicted in Fig. 6A, photodynamic treatment with PS-II, when used alone, did not significantly decrease cell viability in either 5-8F or 6-10B SFCs. However, when combined with LV, laser-activated PS-II dose-dependently decreased cell viability in both 5-8F and 6-10B SFCs. Similar results were obtained for apoptosis induction in both 5-8F and 6-10B SFCs when PS-II was combined with LV (Fig. 6B). These results suggested that LV could sensitize the CSC population of NPC to PDT. 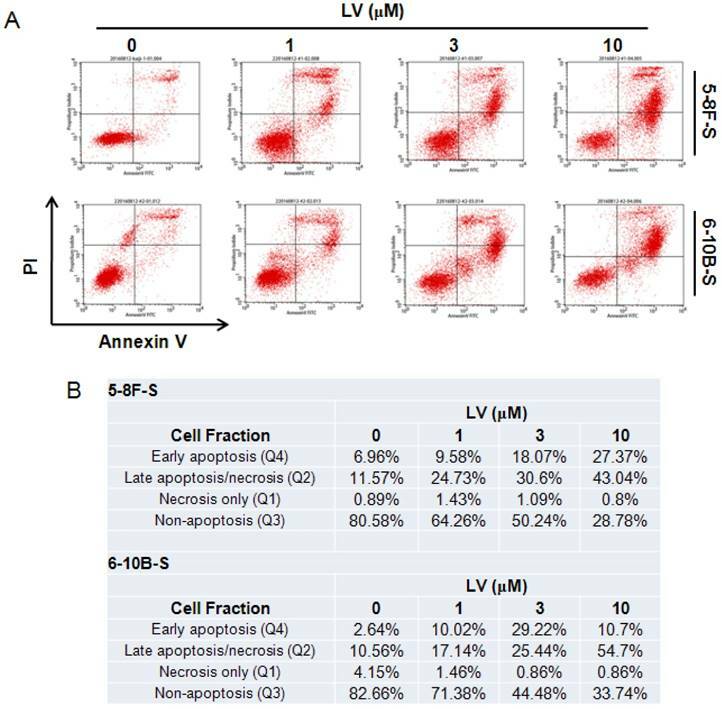 In the present study, we show that LV, a lipophilic statin already used in the clinic to treat cardiovascular disease, inhibited the stemness properties and induced apoptosis and cell cycle arrest of CSCs derived from two NPC cell lines, 5-8F and 6-10B. In addition, we found that LV conferred enhanced sensitivity of NPC CSCs to chemotherapeutic and photodynamic therapeutic agents. The existing treatment modalities usually fail to cure cancer because they cannot completely eradicate CSCs . Therefore, agents that preferentially target CSCs will have a great impact on disease progression and are clinically urgently needed. In our study, although LV inhibited the proliferation of both NPC parental cells and CSCs, the effect on CSCs was much more potent than on parental cells (IC50: 4.79 vs. 11.42 µM for 5-8F; 3.01 vs. 9.30 µM for 6-10B). These observations are in line with a previous report that the growth inhibitory activity of statins is more potent in mesenchymal-like cells with higher protein synthesis rate . The IC50 doses for LV are achievable in clinical trials for patients with various types of tumors in which serum levels of LV reached up to 3.9 µM when taken at 4 mg/kg dose level . In this sense, statins may represent a novel class of drugs that have the potential of targeting the CSCs, i.e., the refractory cells, in NPC. Accumulating evidence has established that the CSCs are responsible for drug resistance and recurrence in cancer. Indeed, the CSC population is more resistant to conventional cancer therapeutics than the non-CSC population . Therefore, sensitizing CSCs to chemotherapy holds great promise in cancer treatment. Cyclophosphamide (CPA), an alkylating agent that belongs to the group of oxazaphosporines, has been used in local-regional NPC as an adjuvant chemotherapeutic agent after radiotherapy . One of the problems of CPA use in the clinic is that besides its anti-mitotic and anti-replicative effects, CPA also has immunosuppressive properties . We found that in the presence of LV, the NPC CSCs responded to CPA more robustly than using CPA alone, suggesting that LV could confer enhanced sensitivity to CPA in NPC CSCs through inhibiting the stemness properties. PDT is a photochemistry-based therapeutic modality in which a photosensitizer is energized by light to produce photodamage of the target cells. PDT is a clinically approved, minimally invasive therapeutic procedure that can exert selective cytotoxicity toward cancer cells . The mechanisms underlying PDT's anti-cancer efficacy may include anti-drug resistance effect, anti-tumor immunity, and photodamage of the tumor microenvironment . PDT has emerged as a promising novel treatment for drug-resistant CSCs because of the selectivity of the photosensitizers . Herein, we showed that the NPC CSCs were resistant to the 1st-generation photosensitizer PS-II in cell culture. However, when the cells were pretreated with LV, PDT using PS-II exhibited cytotoxicity in NPC CSCs. Since PDT offers the advantage of dual selectivity, i.e., both the photosensitizer and the light are required for efficient photodamage, the issue of non-selective cytotoxicity can be avoided or minimized. The above observations together with the reports in the literature support the use of statins as adjuvant therapeutic agents in combination with currently available chemotherapeutic drugs or PDT in the treatment of NPC, pending more in vivo investigations and clinical trials in the future. Lovastatin confers enhanced sensitivity of NPC sphere-forming cells to cyclophosphamide. NPC sphere-forming cells were treated with various concentrations of chemotherapeutic drugs in the presence or absence of LV under hypoxia. (A) Alamar blue cell viability assay was performed 48 h after drug treatment. (B) Photomicrographic images were taken at the end of the 72-h culture period. Original magnification: ×200. (C) Sphere formation was quantified by multiplying the number of tumorspheres and the surface areas of the tumorspheres in each well. Different lower-case letters (a, b, c) denote statistically significant difference between the groups. Combination index (CI) was calculated using the CompuSyn software. * indicates CI < 1.0. Lovastatin confers enhanced sensitivity of NPC sphere-forming cells to photodynamic therapy. 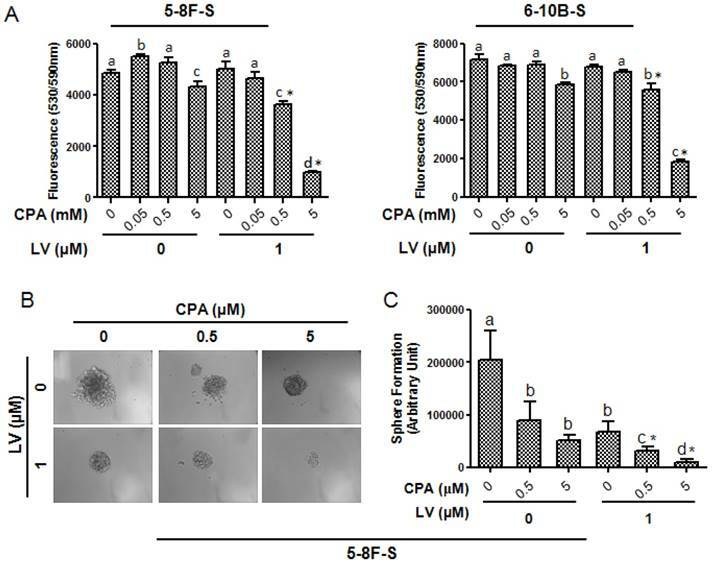 NPC sphere-forming cells were treated with various concentrations of PS-II with or without LV pretreatment under hypoxia. (A) 48 h after photodynamic treatment, the cells were subjected to Alamar blue cell viability assay. (B) 72 h after photodynamic treatment, the cells were subjected to Annexin V/PI staining and flow cytometry. Different lower-case letters (a, b, c) denote statistically significant difference between the groups. Combination index (CI) was calculated using the CompuSyn software. * indicates CI < 1.0. In summary, our studies provide the evidence, for the first time, that LV has the potential to selectively target the CSCs and confer enhanced sensitivity to chemotherapeutic and photodynamic therapeutic agents in NPC. Since the tolerability and pharmacology of LV and other lipophilic statins are well defined, they can enter clinical trials rapidly either as single agents or as adjuvants. These clinical trials of LV in NPC, preferably as adjuvant therapeutic agent, can thus be considered upon the completion of the evaluation in more clinically relevant models such as the patient-derived xenograft (PDX) model . Since the bioavailability of LV is still low after oral administration , other formulations (such as nanoparticle delivery systems) that can increase the bioavailability and stability and that can be directly administered through i.v. injection need to be investigated. The authors would like to thank the colleagues at Cancer Research Institute of Xiangya Medical College, Central South University for the generous help in providing the cell lines and the protocol for tumorsphere culture of NPC.